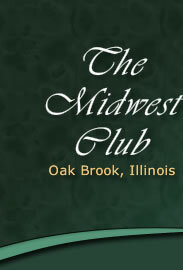 The Midwest Club, located in Oak Brook, IL, is one of the most uniquely beautiful private residence clubs anywhere and provides the opportunity to have luxurious, comfortable homes in a lush, park-like, secure environment. The Midwest Club is a gated community and entry is only gained through the main entrance after receiving clearance from 24-hour, on-site Security. The Midwest Club is not open to the public at any time, nor are any of the Midwest Club facilities. The Midwest Club was created from an unusually beautiful and mature 36-hole golf course. The many glorious vistas it offers are matchless. This picturesque sweep of 231 acres is bordered generally by Butterfield Country Club (31st Street) on the north, Midwest Road on the east, 35th Street on the South and Meyers Road on the west. There are no major arterial highways intruding on the borders of this land at any point. But in less that a mile, there are entries to major expressways leading in all directions. Chicago is only 15 miles east, and O’Hare Airport is only 20 minutes away.